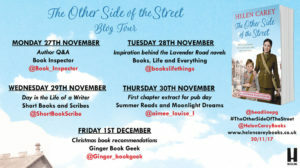 I’m delighted to be taking part in the blog tour today for The Other Side of the Street by Helen Carey. Thank you to Jenny Harlow from Headline for the place on the tour and a copy of the book. 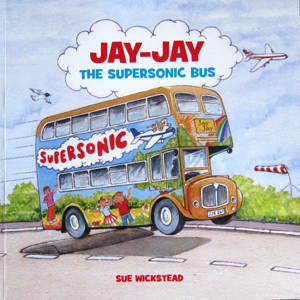 This is a book I would love to have had time to read but unfortunately I didn’t. 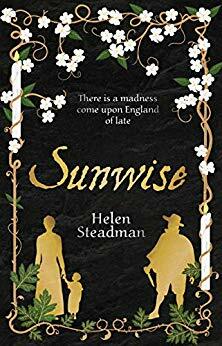 It’s one I am really looking forward to though and in the meantime I have a fabulous guest post from Helen about her typical day. Jen Carter’s relationship with theatrical producer Henry Keller hits a hurdle when an old flame reappears. And when V1 retaliation rockets start hitting London, her mother Joyce’s tentative romance is threatened too. 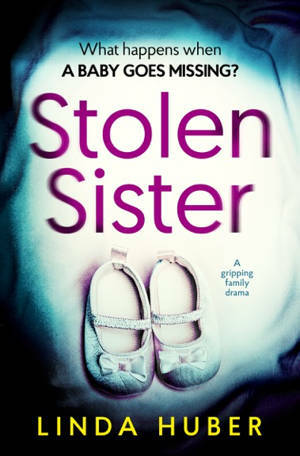 The ebook is available now and the paperback from tomorrow. I’ve been asked to describe my writing day, but my typical day depends on where I am in the writing process. 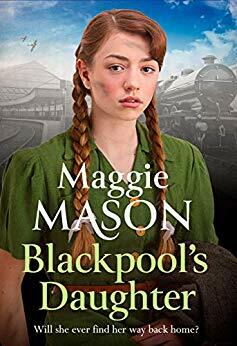 If I am planning or researching a novel, I lead a relatively normal life of working during the day and socialising or relaxing in the evenings and weekends. Sometimes there are nice little research trips (recently I spent a few highly enjoyable days with my French cousin researching wartime Grenoble), or talks to give, or lunch with my editor, or even the occasional fancy award ceremony to attend. But as soon as I knuckle down to the actual writing then I work full time, generally well into the evening and often including weekends. Once I’m involved in a story I find it hard to switch out of it to do anything else. Even when I’m having supper with friends or watching a film, my plot lines are always lurking in the back of my mind. I am very lucky to have a patient husband and dog who don’t mind being ignored for days on end! Each morning I jot down all the ideas that have plagued me during the night and revise what I wrote the previous day, then I take a deep breath and push on to the next scene. If I’m lucky, and I’m on a roll, I manage about 2000 words a day. But the only way I keep up that rate is if I have worked out my story in advance. 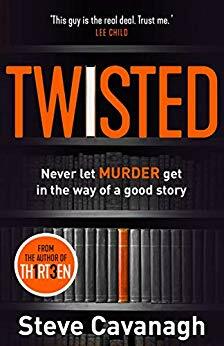 As many of you will know, I like to write tightly plotted novels where everything intertwines and the decisions one character makes affect the other characters. And that means working out the key scenes and turning points before I begin. That’s not to say I know every detail of the novel before I start writing, but I have a definite framework, a theme and a final scene that I keep in mind and work towards. I work out what needs to happen in each chapter before I start writing it, but then I let creativity take over! I love the whole process of writing. I love puzzles, too, and for me planning out a novel is like embarking on a big puzzle, or a three-dimensional game of chess. I also love a good story and I will only start a new novel if I am sure I have a really compelling story to tell. The characters are obviously key to that. 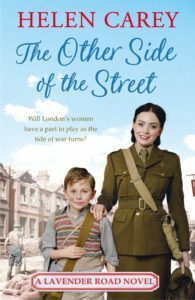 They don’t have to be all good, or even nice; the main protagonist of The Other Side of the Street, pretty, spoiled Louise Rutherford, is far from good, or nice! But they do have to be interesting. If they entertain me then I feel more confident they will entertain my readers! Make sure you have an interesting theme. Work out a page-turning story structure. 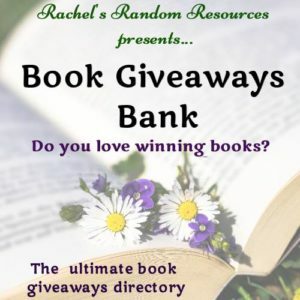 Check out the motivations of your characters. Use dialogue that pushes the story along (not just characters telling each other things they already know). Know your ending, and head in that direction at all times. Oh, and some appropriate humour in either the writing or the story helps too! Thank you for such an interesting post about your writing day, Helen. she began writing she had a range of jobs, including tour guide, army officer and management consultant. 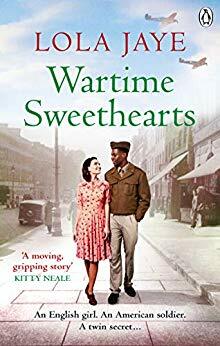 Her Lavender Road novels were inspired by a chance encounter with a neighbour who showed her the sites of the air-raid shelters on Clapham Common. She now lives in Wales with her husband and their two dogs.